not happy. this shouldn't be so difficult. 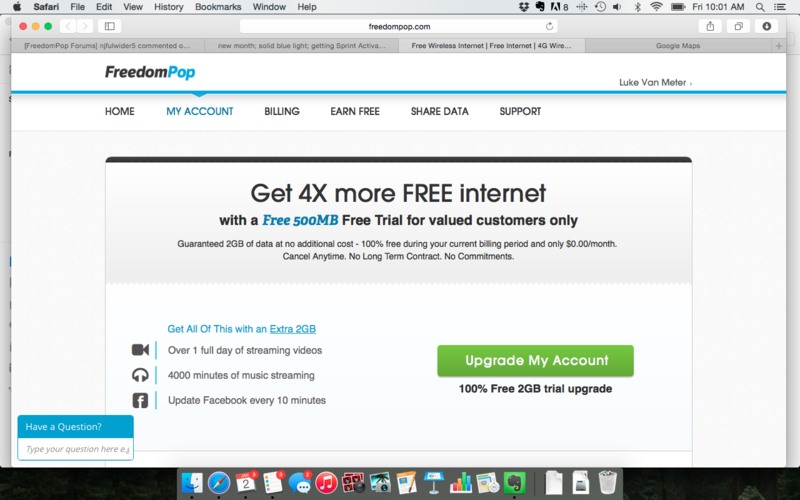 why is there a redirect to setup3g.freedompop.com? note that when I enter mifi.mlp I don't get there: on Kindle Fire Silk, just get the 3g redirect; on iPad Safari just get DNS lookup failed. Have you attempted a update of the profile and PRL yet? another could be the coverage area or maybe the line of site to the device. Make sure you are near a window, with no trees blocking signal...maybe take outside to test. I have even seen other members take the device clear across town to test. make sure your in the 3g/4g coverage..Please take a peek at data/not phone..
On your iPad, you may want to change DNS to 8.8.8.8, 8.8.4.4 to fix a DNS issue, however if it won't work then it means that your device isn't assigned properly to the free plan. Thanks Ali, my account plan shows as 500mb free. When I switched to that on Dec 18, it cut my usage off at 700mb... which I'd gotten on the initial sign up plan. Is there somewhere else in the fp web where I can confirm the assignment? Yes. With fine blue connectivity, I'm directed to the setup3g dataplan page at fp. my plan is 500mb free. I don't want to be forced to a $3.99 a month "pro 500mb plan". I'm in a 4g zone. interesting action: (888) 731-1555 "if you have an existing account and wish to cancel or downgrade, please press 1 otherwise press 2" ... press 2 and call disconnects! @ali... I called at 1030 PDT... I was in service hours. @Ali It looks like I'm having the same problem as @pacos44 . I have the Freedom Spot MiFi 4082 that I transferred to the Free 500 MB of data per month plan. It had been working just fine for a couple of months until the last 2 weeks. It shows solid Blue, but it is not broadcasting any signal. My Nexus Tablet, for example, says that 3G needs to dealt with. So I connected it to the computer and tried to update Profile and PRL, but it won't connect or find anything. The icon just keeps spinning around until the admin sign in times out and tells me to click OK to sign in again. I checked the Sprint coverage map and I'm in a 4G hotspot. I even did the reset with a paper clip. Plus I got through to Support on the phone. They escalated my problem and I received an email from them the next day telling me to do the PRL and Profile updates after I told them I already did that. I want the free data and I am not going to pay $3.95 a month for 3G data. How can I get satisfaction? I should either get a refund or they should send me a Photon. Why are you sharing the same thing that pacos44 has tried many times already? Don't you see that this has already been suggested and that it didn't work? I have exactly the same issue as pacos44. I've tried everything and nothing has worked. I've tried every customer service number multiple times, during business hours, and spent more than two hours on the line waiting. I still have not spoken with anyone. The "dial 1 for a call back" feature doesn't work and I also have not received a reply to my email. The lack of support here is absurd. It seems there's only one answer to everything: update PRL. Well what if there are bugs that keep you from doing that?? And what if you're getting the blue 4G light so 3G problems should be irrelevant?? PLEASE HELP. I'VE WASTED SO MUCH TIME TRYING TO GET MY DEVICE TO WORK. I purchased the MiFi 4082 during the sale in September, and it worked great at first. It recently stopped working exactly as described above (still reports connected at 4G but redirects to the setup3g screen). I've emailed support about it twice, but without response. 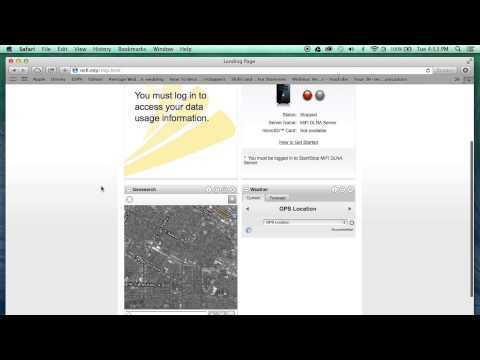 Sprint had previously halted the WiMax rollout, and now they are actually removing the towers. Pittsburgh (my location) was WiMax capable when I purchased, but I bet our towers are being discontinued per the announcement. It's not cool to sell a device you know will soon be useless. Freedompop ought to replace these with a functional model. Have you attempted any of the above troubleshooting ideas? (888) 731-1555--(888) 701-1353, Monday-Friday 9am-5pm PDT. can anybody take a peek at bluenovembers account and see if it needs anything done on your end? Is this the situation that Ali mentioned to us earlier today? @djinks This is the situation I was mentioning. @njfulwider5‌ did a great job with troubleshooting however if you get a redirect to setupwhatever.freedompop.com even after a reset or a PRL upgrade, that fix I pushed to the Pros should work (it does in my experience). I'd tried updating the PRL and Profile before posting, and I've just gone through a factory reset as well. The situation remains the same for me. Checking Sprint's coverage map, I'm in a "Sprint 4G (WiMAX) Best" area. Clearly the 4082 thinks it's 4G connected, but all traffic remains redirected to setup3g. anyway we can fix up clintons account on your side? This seems more like a promotional offer than a bug fix. Is this the page you intended, or am I being redirected for some reason?